Listing: Newly discovered, not yet listed. Using IUCN criteria it is critically endangered. 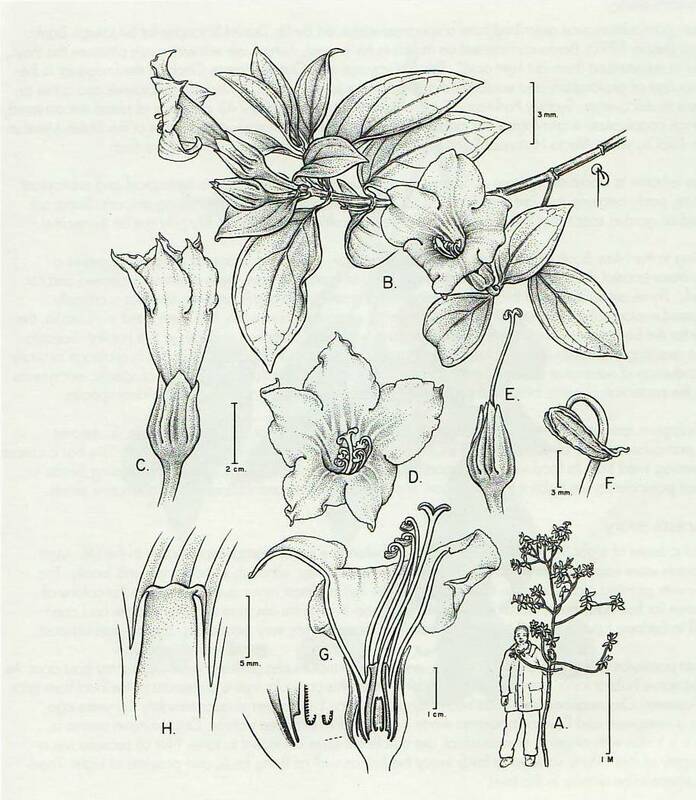 Symbolanthus jasonii, a member of the Gentian family, was collected for the first time during a recent expedition to the poorly-studied Cordillera del Condor on the Ecuadorian-Peruvian border. The plant is 10-feet tall sparsely distinct from other species in the region. This area of South America is dotted with neotropical montane microhabitats that are surrounded by large disturbed areas, so individual plant populations can be many miles apart. Many plants here are found in a very small area, so the odds of any given species being lost completely to habitat conversion is high. 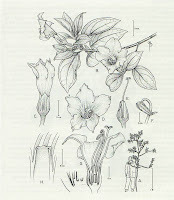 I have drawn over 20 species and varieties of Symbolanthus, but most have been reconstructed from single pressed herbarium specimens. In contrast, the new species provided me with refreshingly complete material from which to prepare an illustration. I was able to dissect a pickled flower (a flower preserved in a liquid solution) to show the distinctive corona (the ‘ring’ that gives the genus its common name of Ring Gentian). More of the plant’s story and the artist’s story can be found in the exhibit catalog, available at the exhibition venues or online from the ASBA. The ASBA is a nonprofit organization dedicated to promoting public awareness of contemporary botanical art, to honoring its traditions, and to furthering its development. Losing Paradise? Endangered Plants Here and Around the World is a project of The American Society of Botanical Artists. At the convergence of art, science, conservation, and education, the exhibition includes 44 works of botanical art portraying endangered plants in a variety of media.